In the next couple of weeks, retailers will be taking preorders for the new assortment of 6″ Black Series medium size vehicles which will include products like the Dewback with Sandtrooper that was previewed at SDCC. Toys”R”Us has already started seeing them show up in their databases, expect to pay about $50 for offerings in this assortment. Image courtesy of Galactic Hunter. Saw Sabine/Stormtrooper and Wookiee Rebels 2-packs at Target tonight. Adam Pawlus (Galactic Hunter, 16bit) has posted via twitter the sighting of the Mission Series Sabine and Stormtrooper and Wookiees pack at his Target in Arizona. Bring’em on I say. SDCC 2014: Target Exclusive Rebels Vehicle Asst. Our friends at Galactic Hunter have posted via Facebook the reveal of 2 Target Exclusive Star Wars Rebels vehicle sets slated for November. Head on over to check out the Inquisitor’s TIE Advanced Prototype with The Inquisitor and The Phantom with Kanan Jarrus. Hasbro’s new TVC X-Wing has been found at Toys”R”us – check out reports by both Galactichunter and Jeditemplearchives for the scoop. Don’t have Twitter or Facebook? 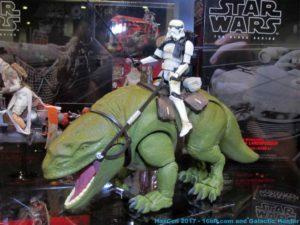 Click on through for all of our tweets from this morning’s Star Wars Collectibles Panel at SDCC featuring Sideshow, Kotobukiya and Gentle Giant. Our friends at Galactic Hunter have snapped a pic from Hasbro’s booth showing a placard for an exclusive Droid Factory set coming this November for $59.99. It looks to include many of the canceled Build-A-Droids and other from the defunct Droid Factory line. Jedi Temple Archives received word at Toy Fair from Hasbro that they were trying to get these figures to the public, so it’s nice to see it’s coming to fruition. Gentle Giant has some great new items on display at SDCC – the newest is this awesome realistic Clone Wars Yoda statue. Head to Galactic Hunter’s Facebook page to give it a look and like! Amazon is also taking pre-orders for their exclusive TVC TIE Interceptor for $50.00 – shipping on Aug 15. Thanks to Adam at Galactic Hunter and Chuck M. for the tip.